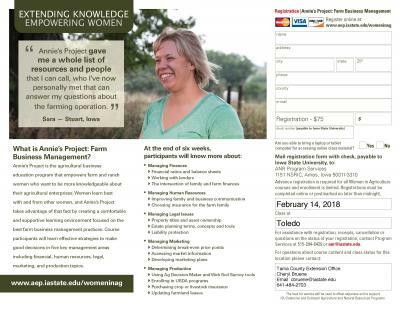 Iowa State University Extension and Outreach Women in Ag program is holding Annie's Project: Farm Business Management beginning Wednesday, February 21, 2018 in Toledo, Iowa and continuing February 28, March 7, March 14, March 21, and March 28, 2018. Classes are 8:30 a.m. to 11:30 a.m. with a light meal served at 8:00 a.m. 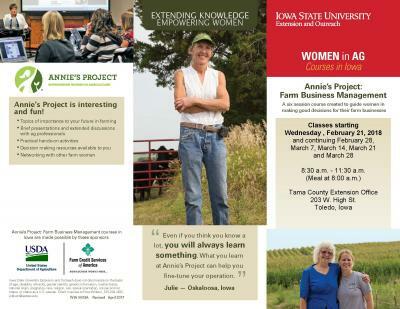 The classes will be held at Tama County Extension Office, 203 W. High St., Toledo, Iowa. Cost is $75.